How can you lend someone almost £120bn and not have a hole in your budget? Or how can you give out £17bn, only receive back £3bn and not be any worse off? When you're the government and it's the student loans system. There is growing scepticism over how student finance is recorded and it is not only the idle banter after an accountants' dinner party. It could delay the high-profile review commissioned by the prime minister into tuition fees and university funding in England. It could also mean a significant rethink of the level of fees and how much public money is spent on subsidising them. The Office for National Statistics is going to decide towards the end of the year whether the public reporting of the cost of student finance has to be overhauled. If the ONS orders changes - then the tuition fees review, expected to report back to the government in November, could have to go back to the drawing board. The universities body, Universities UK, now says "it would make sense" for the fees review to wait until the ONS reaches its decision. Under the current arrangements, money lent to students for tuition fees and living costs does not show up as a negative in the public finances. As the scale of student borrowing has grown, it has become an increasingly awkward omission - with hard-hitting cross-party reports from MPs and peers saying it was stopping proper scrutiny of student finance. Outstanding student loan debts are £118bn and rising - but when it comes to the public finances and the deficit, the cost of student loans is invisible. In terms of the government's reporting of its finances, the cost is kicked down the road and won't appear until debts begin to be written off after 30 years. In the summer, the House of Lords economic affairs committee took an elegant wrecking ball to this, saying it was a "fiscal illusion" that concealed the real public cost of tuition fees. The committee members, including three former chancellors, were taken aback by what they saw as a financial conjuring trick. Committee chairman and former Conservative minister Lord Forsyth said he was "shocked". "I had not understood that by moving to a system of funding through loans, because of the accounting methods of the Treasury, it was possible for George Osborne [then chancellor] to appear to increase funding for higher education by £3bn but at the same time cut his deficit by £3.8bn," said Lord Forsyth. The House of Commons Treasury Select Committee had previously flagged deep concerns. Switching to a system of fees and loans had "shifted nearly all higher education spending out of the deficit", in a way that "escapes scrutiny". 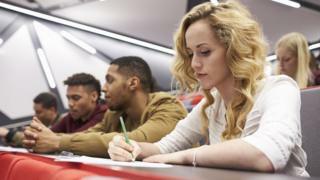 The committee, chaired by former Tory education secretary Nicky Morgan, said "there is no effective control over the increasing fiscal cost of the student loan regime". It was "equivalent to excluding the entire NHS capital budget from the deficit", said MPs. The politics of tuition fees have always been difficult - and last autumn Theresa May announced a review of student funding, headed by banker Philip Augar. It would become a much tougher political question if university costs were factored into the deficit. The fees and loans system would show up as an immediate cost. The Office for Budget Responsibility has examined how much is lost in the loans system. For the 2017-18 cohort of students, the OBR forecasts that only 39% will be repaid - and 61% will be written off, at a cost of £28bn. Should that £28bn, the gap between lending and repayments, be counted against the public finances? The ONS has highlighted that £17bn was paid out last year and about £3bn was received in repayments. How should that £14bn gap be shown? There are many different ways in which this could be added - but it seems increasingly difficult to see that none of it should be counted. If the ONS decides to change the financial ground rules in December, it wouldn't mean that any more or less money was spent. But it would make a big difference to how the figures looked and to the politically-charged question of whether the deficit was really shrinking. Would the current fees system seem so attractive to ministers if billions were being added to the deficit? Would the whole byzantine system of fees, loans and write-offs look too expensive and out of control? Would there be a temptation to cut the cost of lending by reducing the level of fees? Because what gets measured can be what counts.